Calling all fashionistas! 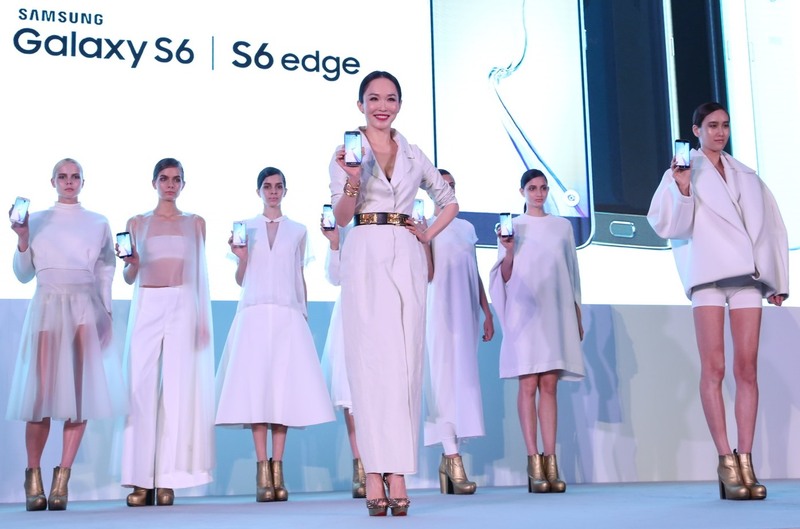 Fann Wong wants you to ditch your iPhones in favour of a Samsung Galaxy S6 or S6 edge. Appointed to be the ambassador for the new Samsung Galaxy S6 and S6 edge, the celebrity mum made her appearance at a recent showcase celebrating fashion, technology and performance as part of the Galaxy S6 World Tour 2015. Designed to appeal to “fashion-forward consumers”, the new Samsung Galaxy S6 and Galaxy S6 edge were created by the Korean electronics giant to fend off fierce competition from Apple, XiaoMi and other smartphone competitors. Adorned in a range of colours with a “jewel-like” feel, these latest phones come in sleek metal frames and reflective glass finishes. 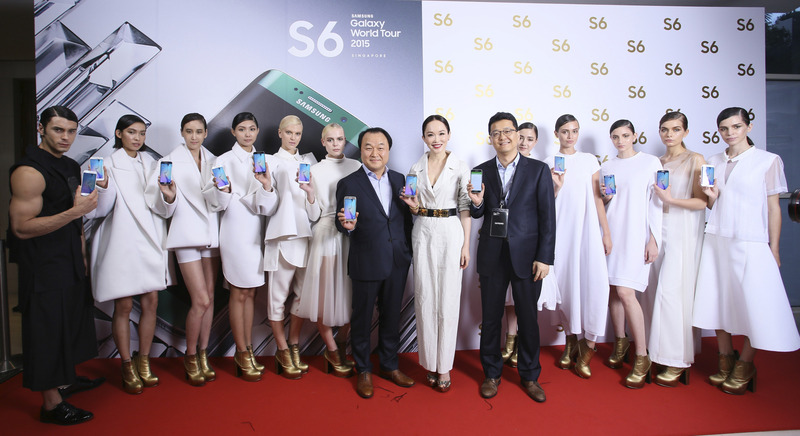 Sparing no expense, Samsung’s Galaxy S6 World Tour is an extension of its partnership with the Orchard Road Business Association to marry fashion with mobiles. Spanning six weeks, from mid April to end May 2015, Samsung Fashion Steps Out @ Orchard 2015 will launch the Spring/Summer fashion season with runway shows, distinctive exhibitions, and exclusive shopping promotions in the Orchard Road belt. Working with fashion consultant and stylist Jeffrey Tay, Samsung’s launch event included a fashion show featuring specially designed outfits inspired by the Galaxy S6 and S6 edge. Led by Fann Wong, 20 models attired in futuristic black and white apparels designed by Max Tan and Joe Chia paraded around the Amara Resort ballroom in Sentosa. Their outfits were paired with the Galaxy S6 and Galaxy S6 edge smartphones. 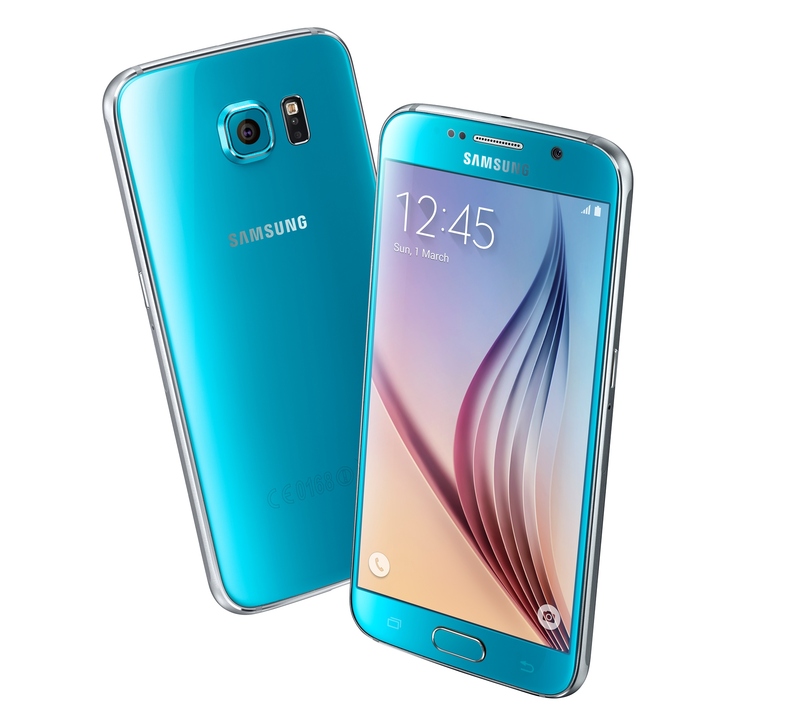 Beyond the glitz and glamour of the launch event, how good are the new Samsung Galaxy S6 and S6 edge phones? Well, pretty amazing, at least based on my initial assessment of the devices. Perhaps the most outstanding feature of Samsung’s new Galaxy smart phones are their cameras. Images taken by both the rear and front cameras were clear, vivid, and bright, even in the dim and blue lighting conditions of the Amara Resort Ballroom. Zooming and focusing were effortless. Most of the photos turned out pretty good even for moving objects in a dim room. According to Samsung, the camera boasts of f1.9 lenses and high resolution sensors both front (5 MP) and rear (16 MP). Key features include an Auto High Dynamic Range (HDR), smart optical image stabilisation (OIS), and IR detect white balance (for advanced light sensitivities). A new “quick launch camera” feature further provides users with fast direct access to the camera from any screen in less than 1 second. Apparently, both the Galaxy S6 and Galaxy S6 edge are the fastest charging smartphones in the world. Charged through the wire, they provide up to 4 hours of usage after only 10 minutes of charging. This is 1.5 times faster than their predecessor the Galaxy S5 4G+. An ultra power saving mode also allows the phone’s battery life to be extended when it reaches 10%. I guess this is convenient when you can’t find a power socket or battery pack anywhere. Both phones can also be charged wirelessly using most wireless pads in the market. With a dimension of 142.1 x 70.1 x 7.0 mm and weighing only 132 grams, the Galaxy S6 is slim, easily held and aesthetically comparable to the iPhone 6 and 6 Plus. The more outstanding of the two, the Galaxy S6 edge features both a solid grip and an immersive viewing experience with a curved display on both sides. Adorned in a variety of colourful jewel tones, including White Pearl, Black Sapphire, Blue Topaz (below) and Gold Platinum, both phones are encased in Corning Gorilla Glass 4 – considered to be the toughest glass to date. 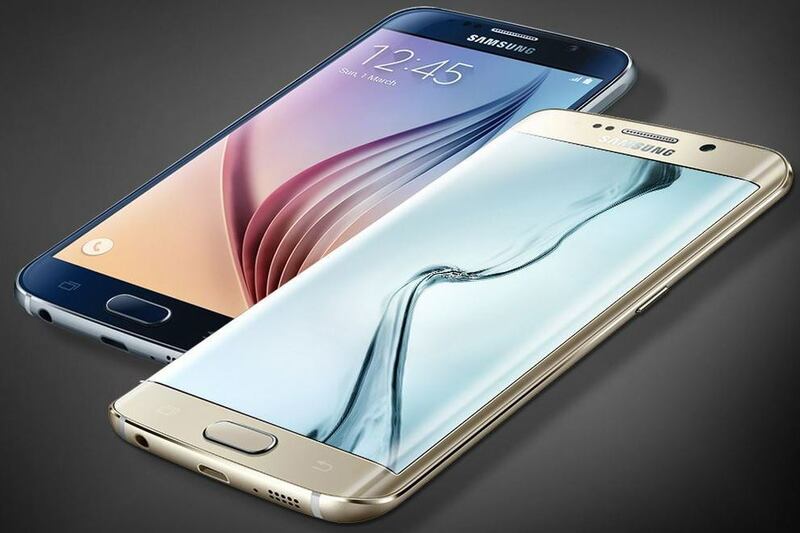 Despite being thin and lightweight, both the Galaxy S6 and Galaxy S6 edge feature the fastest Samsung technology available. Using Samsung’s first 14 nm mobile processor with 64-bit platform, new LPDDR4 memory system and UFS 2.0 flash memory, the phones boast of better performance and improved memory speed while lowering power consumption. Video performance has also improved. Through the 1440P/VP9 hardware based codec, users can view high resolution streaming videos. In addition, the 5.1 inch Quad HD SUPER AMOLED screen offers what the manufacturer claims to be the highest pixel density of 577 ppi. This works both outdoors and indoors. Finally, and perhaps most significantly for corporate users, the Galaxy S6 and Galaxy S6 edge are built on an improved end-to-end secure mobile platform. This will supposedly provide the phones with real-time protection from potential malicious attacks. Various enhancements are also available for both phones to be adopted by enterprises. Additionally, a Find My Mobile feature helps users to protect their personal information once the mobile is lost. This includes a remotely activated “Reactivation lock”. Last but not least, an enhanced touch-type fingerprint scanner allows for quick authentication and saves encrypted data in secure device storage.